Through investments in training and innovation, Canada’s universities and colleges anchor the economic livelihood and social wellbeing of communities and our country. In addition to teaching and research, their impact is expressed in the people they hire, the goods and services they purchase and the ways they invest their financial, physical and relational assets. Recognizing their latent capacity to shape better outcomes as economic actors and social innovators, post-secondary institutions are beginning to apply their assets to building “social infrastructure.” The University of Winnipeg Community Renewal Corporation (UWCRC) is an outstanding example of a social infrastructure strategy. It comprises investments in urban renewal, post-secondary infrastructure, affordable housing, food services and more. 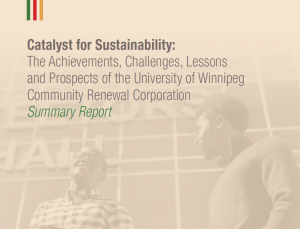 The report Catalyst for Sustainability: The Achievements, Challenges, Lessons and Prospects of the University of Winnipeg Community Renewal Corporation documents this model so that others can learn from it as they develop their own approaches. I hope that readers of this case study will recognize and be inspired by what can be accomplished when post-secondary institutions position themselves as engines of inclusive growth. If you would like to read more about Social Infrastructure, the 2017 report, Maximizing the Capacities of Advanced Education Institutions to Build Social Infrastructure for Canadian Communities, explores this opportunity in depth.